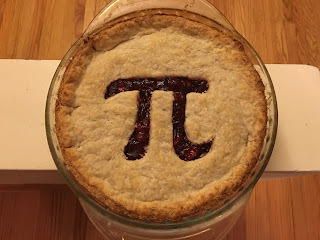 Startled Disbelief: Happy Pi Day! I love pie. I am also lucky enough to be married to an excellent baker, who kindly makes me a pie for my birthday every year. But before we get to the recipe, I'm going to tell you about the first time she made me a cranberry pie. Several years ago—probably almost a decade; it was before we were married, anyway—Laura asked me what kind of cake I wanted for my birthday. I replied that I'd much rather have a pie, which is in all cases superior to cake. "Okay," she said. "What's your favourite kind of pie?" "Cranberry," I replied instantly. Cranberry is the best berry, so naturally it makes the best pie. "Cranberry pie? I've never heard of that. But I'm sure I can find a recipe." She cut me a slice, and I took my first bite, and let me tell you: it was delicious. She describes the taste as "kind of like Fruit Roll-Ups", which doesn't really do it justice, but I can't come up with a better description—so my suggestion is to just make the pie and try it for yourself. But I'm getting side-tracked. Laura was looking at me expectantly. "How is it?" she asked. "It is great," I said. "Best cranberry pie you've ever had?" I hesitated. "Yes," I finally replied. "Well, is it better than any of the other cranberry pies you've tried?" I took a deep breath. "Well, I haven't actually ever had a cranberry pie before." Laura was distinctly unimpressed, and I can't really blame her. I'm lucky that she puts up with me. But in my defence, I was right: it really is my favourite kind of pie. * I actually only use 1½ cups of sugar myself, but I like my tarts tart. Preheat oven to 425° (why are all of my recipes in Fahrenheit?). Halve each cranberry, then add them to the water in a saucepan and bring them to a boil. In a mixing bowl, sift together the sugar, starch, and salt. Decrease heat and add the dry ingredients slowly to the boiling cranberries and cook, stirring regularly, until it thickens. Remove from heat and stir in the almond extract. Allow filling to cool completely. This is a good opportunity to make the crust. Laura uses a pretty standard Crisco crust, but whenever I make a pie I use this recipe that I poached from Greta Christina a few years ago (though it's evolved a little along the way). Here's a link to the original. Sift the dry ingredients together. Cut the shortening into small pieces and add it to the flour. Using a pastry cutter, break the shortening into small pieces roughly the size of peas coated with flour. Combine the water and vodka and sprinkle over the flour mixture, enough to make the dough hold together and roll out without making it too sticky. Liquid measures in a pie crust recipe are always approximate, so you may need less, or perhaps more. Break the dough into two pieces (divided about two fifths and three fifths). Sprinkle flour onto your rolling surface, place the larger portion onto the surface, and sprinkle it with flour as well. Roll the dough out from the centre. Place it gently in the pie plate and flatten the edges over the lip. Prepare the second portion of the crust as above and set it aside; it will be used to top the pie. Fill the pie as desired, then place the second crust over top. Pinch the crust together where the top and bottom overlap then trim the remainder along the edge of the pie plate.